Jubal Anderson Early was a prominent Confederate general during the American Civil War. His Army of the Valley battled Ohioan and Union General Philip Sheridan's force for control of Virginia's Shenandoah Valley in 1864 and early 1865. 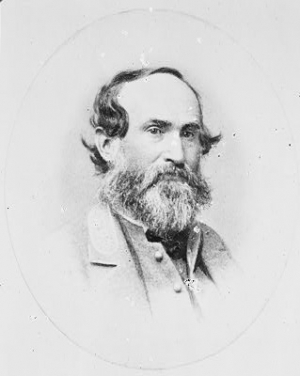 Jubal Early was born on November 3, 1816, in Rocky Mount, Franklin County, Virginia. Early was the third of ten children born to Ruth Hairston Early and Joab Early, a wealthy tobacco farmer and local politician. After attending local schools and private academies in the Lynchburg and Danville, Virginia area, Early received an appointment to the United States Military Academy in 1833. He graduated from West Point in 1837, eighteenth in his class. Upon leaving the academy, Early served briefly in the Second Seminole War in Florida (1835-1842). Early remained in the army only one year, before resigning his commission to study law. After passing the bar, Early practiced law in Virginia during the 1840s, where he also served one term in the Virginia House of Delegates. When the secession crisis developed, Early served as a delegate to the Virginia Convention of 1861, and he voted against Virginia leaving the Union. When Virginia did secede, Early remained loyal to his home state, and he accepted a commission as a brigadier general in the Virginia Militia. He quickly was promoted to the rank of colonel in the regular Confederate Army. Early fought in most of the major battles in the Eastern Theater of the American Civil War, including the Seven Days Battles, Second Bull Run, Antietam, Fredericksburg, Chancellorsville, Gettysburg, the Wilderness, Spotsylvania Court House, and Cold Harbor. He was wounded at the Battle of Williamsburg (May 5, 1862). An aggressive leader, Early rose through the ranks steadily. In June 1864, Early reached his highest rank when Robert E. Lee promoted him to the temporary grade of lieutenant general and placed him in command of the newly created Army of the Valley. Lee hoped that Early's army, operating out of the Shenandoah Valley, would be able to draw troops away from Union General Ulysses S. Grant's drive toward the Confederate capitol, Richmond, Virginia. Lee's strategy was initially successful. On June 28, 1864, Early's forces seized York, Pennsylvania, the largest Northern town to fall to the Confederates during the war. On July 11 and 12, the Army of the Valley reached the outskirts of Washington, D.C. Although Early's offensive caused considerable panic in the nation's capitol, he was forced to withdraw before entering either city, when faced with mounting Union reinforcements. Grant, put an end to Early's guerrilla attacks by sending an army under the command of General Philip Sheridan, an Ohioan, into the Shenandoah Valley in August 1864. Enjoying a numerical advantage of nearly three-to-one, Sheridan defeated the Army of the Valley at the Third Battle of Winchester (September 19, 1864), the Battle of Fisher's Hill (September 21-22, 1864) and the Battle of Cedar Creek (October 19, 1864). Meanwhile, as Lee's situation near Richmond worsened, he recalled most of Early's forces for the spring campaign in 1865. That enabled Sheridan to destroy the remnants of the Army of the Valley at the Battle of Waynesboro (March 2, 1865). Lee relieved Early of his command on March 30, 1865. When Lee surrendered to Grant at Appomattox Court House (April 9, 1865), Early donned a disguise and traveled to Texas, hoping to continue the war. When those efforts failed, Early fled to Mexico and then to Canada, choosing not to live under Northern rule. In 1868, President Andrew Johnson pardoned Early, facilitating his return to Virginia, where he resumed his law practice. Early remained an unreconstructed Rebel who founded the Southern Historical Society in 1873. He served as this organization's president until his death in 1894. This group promoted the Lost Cause movement, which glorified the Confederate war effort and was dismissive of Union military accomplishments. Jubal Anderson Early died on March 2, 1894, in Lynchburg, Virginia. He is buried in the community's Spring Hill Cemetery.